Sukhoi Civil Aircraft (SCAC) last Thursday gained Russian certification of a long-range version of the Superjet 100 known as the SSJ100-95LR, following 115 hours of testing during 60 flights since February 15. Five percent more thrust generated by the airplane’s Powerjet SaM146 turbofans and strengthened wings increase the airplane’s range to 2,472 nm from 1,590 and maximum takeoff weight to 109,109 pounds from 101,150. SCAC plans to deliver the first SSJ100-95LR in an all-economy-class, 90-seat configuration to Russia’s Gazpromavia during this year’s third quarter. Gazpromavia has ordered 10 of the long-range airplanes. The company expects that by 2015 all new Superjets will roll off the assembly line as LRs. The milestone comes as Sukhoi Civil Aircraft (SCAC) faces increased scrutiny for the SSJ100’s rather inauspicious operational debut and a weak financial position attributable largely to slower-than-expected production at its final assembly plant in Komsomolsk-on-Amur, Russia. Having delivered only five SSJ100s so far this year at so-called launch prices, SCAC continues to lose money on every airplane it ships. The company has acknowledged its cooperation with the Russian government on a financial restructuring plan that would reduce its overall debt exposure. 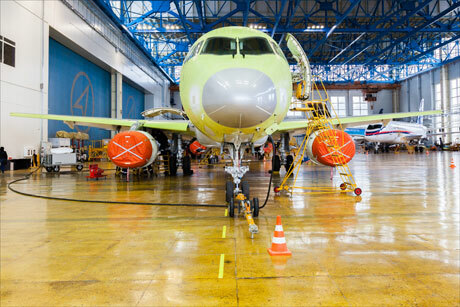 At the same time, it aims to reduce the cost of various SSJ100 components and to improve the effectiveness of its production and sales activities. A spokesperson said that the company would achieve an operating profit next year and net profits the following year based on anticipated revenues of more than $1.5 billion (rising to $2 billion by 2018). Approximately 60 percent of the capital for the SSJ100 development has come from external credit, for which the company pays interest rates of around 7 percent. The company admits that such a degree of dependence on credit has negatively affected its financial performance, but it insists it hasn’t fallen behind on repayments. Meanwhile, it also acknowledged that the need to offer the new aircraft at significant discounts to early customers has diminished cash flow. Last year the state-owned Vnesheconombank opened a $1 billion line of credit for SCAC. In late July the bank suddenly sold almost half of its 5-percent stake in European aerospace group EADS for almost the same amount. Neither the bank nor the Russian government has confirmed whether the unexpected share sale stemmed from a need to free further funding for SCAC. It is a good plane. The Russian and CIS need this. It is also a way to keep in the frame of technology. No industry means no tech. So the Russians need speed up and deliver. Take modern ways and make these great planes. They can sell some to iran as some of the ones returned are old and the embargo by west is just to stop tech advancement. It needs sell some of 204sm now to Iran and other countries. As West is trying to control things. The Chinese will overtake Russia if they do not look ou. SJ100 is good, I hope it becomes great. It needs better production rates and quality checks. A good plane for CIS and friends.